My needles are melting and it’s all because of Bridge. The back is finished and the front is about 80% of the way there. I still have to pick up the stitches around the sleeves and v-neck but I’m hopeful to have it done before I go back to work (tear, Monday!) 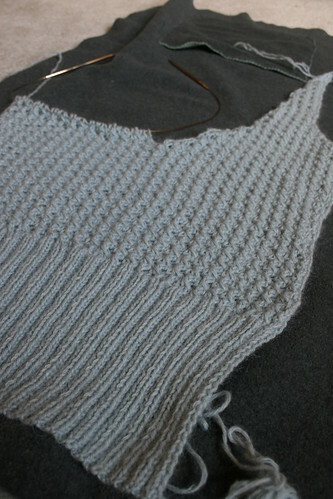 All this super-speed knitting will be coming to a woeful end. But if you’re going to go out with a knit bang why not make it a Rowan knit bang. The color is waaaay off! It is more of a baby blue than the greyish-brownish color you see here. I’m at my parents house today doing some much needed Laundry (woo!) and the lighting conditions aren’t the best. One of my favorite parts of this sweater is the stitch pattern. I love the cable element to it. And such great texture! 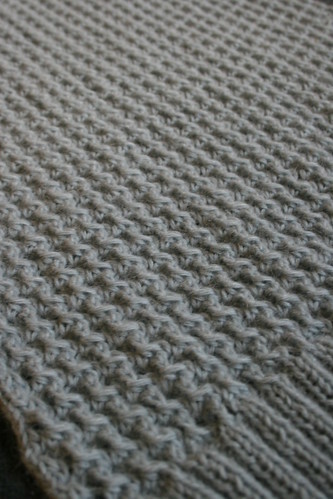 I’m usually one to just want to knit stockinette because I love that simple classic fabric that it makes but this stitch really is pleasing. One more side to to on the front and then we’re seaming and short-rowin’! As for my non-knitty life….My experience in camping was short lived. Did you know that you actually have to book a campsite ahead like you would a hotel? You can’t just show up with a tent and plop down anywhere. Sorry my experienced campers out there but I had no idea!! Or at least I didn’t think every park would be Booked. It was a hilarious experience driving from one state park to another – in the end we probably clocked 300 miles on the car and a good 4.5 hours. We drove out to High Point State park where we finally felt defeated and thus parked along the side of a road near a lake and waited until it got dark to see the Perseid meteor shower. Just seeing one huge light streak across the sky made it worth every moment in the car. We will though attempt camping again – the right way – Booking ahead! Ooh gotta add the fabric softener 😉 Have a great Monday! I love that squishy lookin’ thing! the texture is amazing! Sorry to hear about the camping mishap, but I’m glad you were able to still see something! You are breaking land speed records with that project, way to go! 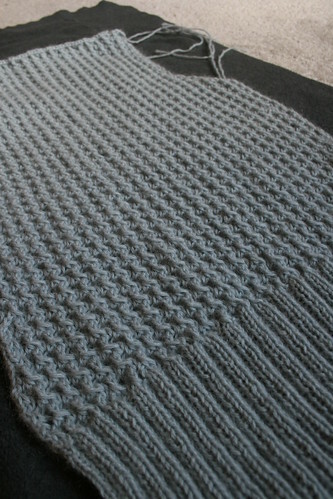 I agree with the poster who commented on the squooshyness of the stitch pattern, love it. wow – that was a fast knit! the pattern and texture are great – not too busy, but a wonderful experience for the eyes…..